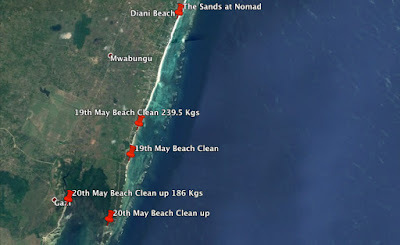 For over a year now The Sands at Nomad and the Diving The Crab dive center have been trying to make a difference by keeping the southern section of Diani Beach clean. 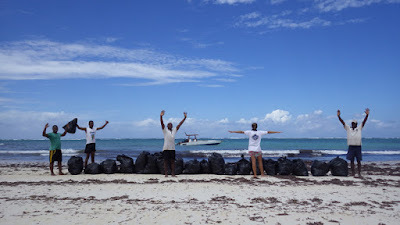 Once a week on Takataka Tuesday (Takataka is 'rubbish' in Kiswahili) staff from The Sands and The Crab dive center will take sacks and clear trash from as much of the beach as they can. 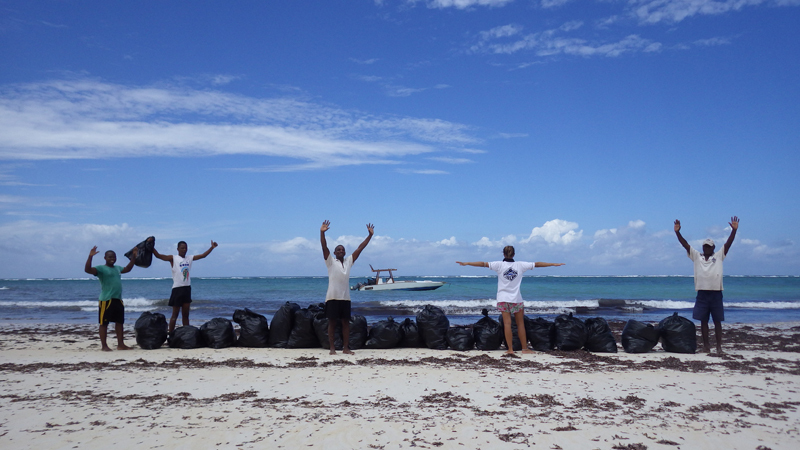 Three times in 2017 The Crab diving center provided fuel, staff and the use of one of it's dive boats to assist in cleaning up some of the corral coves to the south or Galu around Kinondo, Chale and even as far as Gazi beach far to the south. On one of these days alone (June 4th) 239 kilograms of trash was cleared from these coves and beaches. Since collections began being weighed in April 2017 over 1000 kilograms of trash have been removed from these beaches by The Sands and The Crab. LEFT: A 'before' cleanup photo taken on one of the Kinondo cove beaches. Note the sea turtle nest behind the trash. BELOW: The after clean up photo. On the 'International Beach Cleanup day' (September 16th) The Sands and Diving the Crab again provided a boat, fuel, staff as well as the supply truck. On this day with multiple partners and close to 500 volunteers 1200 kilograms of trash was collected from between the Tiwi River to Gazi beach! All this trash was separated into plastic, glass, paper, trash and rubber.